My favorite neighborhood in Detroit is on Fenkell Avenue and Livernois on the west side of Detroit. It can be found right off the John C. Lodge Freeway. This neighborhood is where my church is located, New True Vine Baptist Church (NTVBC). However, NTVBC is not only a church, it’s the foundation of the Jennings family. My grandfather pastored for 55 years and passed the church down to my father to continue the legacy. There are hundreds of memories webbed within this neighborhood. It symbolizes strength, drive and purpose. This neighborhood is about survival, failure, success and community…Although it is not the prettiest neighborhood in Detroit, it has more love than I’ll never know on my time here on earth. The challenge project our fellowship is currently working on is with the Detroit Land Bank Authority. I am apart of the Community Partnership team and our aim is to provide optional tools to connect community leaders and organizations to the land bank. 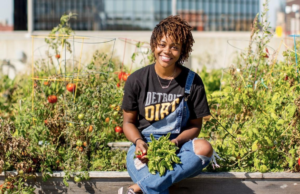 There is a current narrative that has created a divide between the land bank and Detroit organizations. This is where the challenge begins. From this experience, I am learning about real estate in the aftermath of a serious tax foreclosure crisis that continues to plagues the city. This crisis has left hundreds of thousands of houses, land and commercial properties vacant. My host company is Goodwill’s Green Works, a subsidiary of Goodwill Industries of Greater Detroit. Goodwill’s Green Works provides asset recovery services that help save money and are safe for the environment. My host company prepares individuals with the skills for middle-class factory employment positions. It provides real life experiences in a professional environment. Goodwill’s Green Works offers both transitional work experience and independent employment opportunities for individuals in our programs, and in the community. This non-profit provides a second chance for employees and trainees to redirect their own lives in a more productive and meaningful way. Here at Goodwill’s Green Works, I work with the marketing team. We produce newsletters, pamphlets, videos and social media content to not only tell the mission of the company, but to advertise our services to other companies. This provides more employment opportunities within our community as we partner with more businesses. It has been such a blessing working with a company that truly stands behind their mission. Each day I work with men and women who are respected regardless of their employment position within the company or their personal past. I hope to have contributed a creative and passionate impact to my host company and within the city. 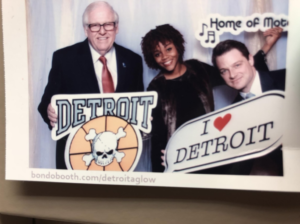 My marketing manager, Keith Littler and the President of Green Works, Jay Wilber have provided me opportunities to shadow and learn the in’s and out’s of Green Works, Goodwill Industries of Greater Detroit and a few businesses that Goodwill supports. Throughout the year, anything that would provide a learning opportunity for me within the company, they were in full support. I enjoyed the freedom to explore, learn and develop in a professional work setting. I believe that, with the skills and experiences I’ve acquired, I’ll be able to make an even bigger impact in my city than I had ever expected. What are you most looking forward to during the second half of your fellowship year? During the second half of my fellowship year, I look forward to learning new things and connecting with more leaders and organizations in the city making a difference. I look forward to sharpening my skills with marketing, software program development as well as community development. I have grown very close to many of my fellows, I plan on continuing my relationships with them and supporting them in their future endeavors to better serve our city. My fellowship will shape my career moving forward because of the experience I’ve gained during this time. I’ve learned new things that I wouldn’t have been exposed to otherwise. This fellowship, along with my host company continues to challenge me as I step outside of my comfort zone to learn new things. I am proud of what I’ve learned and accomplished so far and am excited to see what God has in store for me in the future. 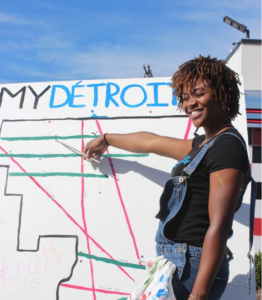 To learn more about Arnesha’s experience in Detroit, check out her spotlight video!